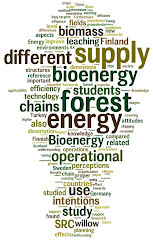 Bioenergy Corridor: On international forestry education: what motivate students? On international forestry education: what motivate students? In the context of globalization in higher education, the increasing importance of student mobility and the challenges of aligning forestry curricula to changing societal demands, this study explores the motivation of forestry students seeking graduate degrees in a foreign country. Within the framework of the expectancy-value theory of motivation, a qualitative approach is taken to provide an in-depth characterization of a group of 20 students from 14 countries starting a multi-institutional graduate program in Europe. Results indicate a high motivation, but also a great variability, of expressed motives and goals. Within a wide range of interests, climate change and carbon sequestration issues appear among the hottest topics alongside some traditional areas. High interests in continuing to doctoral studies and in returning to work in their home countries are reported. Findings of this research provide potential value for curriculum development of international programs in general and of forestry programs in particular.